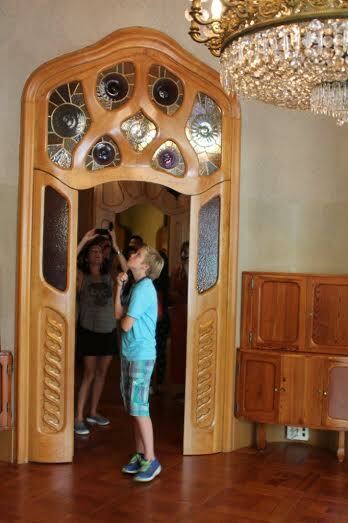 The next stop on our visit to Barcelona was to see CASA BATLLO. This iconic Modernist masterpiece is located in the center of Barcelona on the historically prestigious street Passeig de GraciaI. It was originally commissioned by Lluís Sala Sánchez but totally renovated by the Batllo family from 1904 -1906. It is known locally as the House of Bones, no doubt because so much of its form is inspired by the vertebra of both man and other animals. Can you see the reference to vertebra in the design of the staircase? 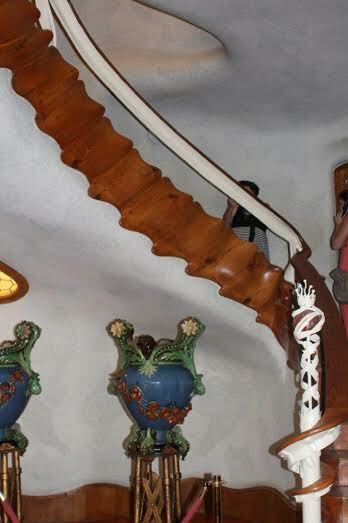 The house, like so much of Gaudi’s work, incorporates fantastical earthly and non-earthly themes. For example, the ocean with its waves, sea creatures and sea shells carved on the doors, are captured in tile. 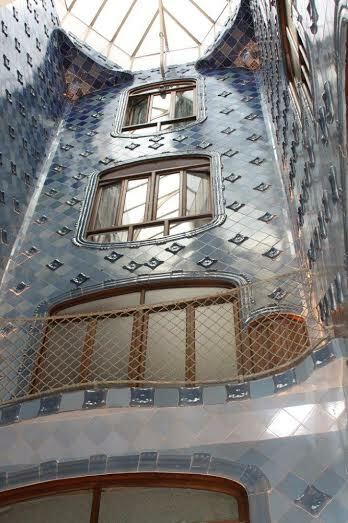 As you can see, Gaudi’s Casa Battlo makes wonderful use of colored tile, in particular the color blue. A fine example of this is the inner shaft that was used to cool the house with louvered wooden shutters that opened to allow cool air in. The curvaceous and fluid shape of the wooden windows and doors is reminiscent of tree roots and plant tendrils. Be sure to take notice of the unique wainscoting design on the walls. And the arched roof crowns of the building are, by all accounts, Gaudi’s interpretation of a dragon. 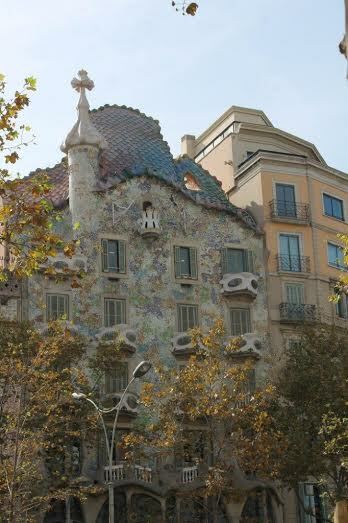 Can you spot the dragon on the rooftop of Casa Battlo? 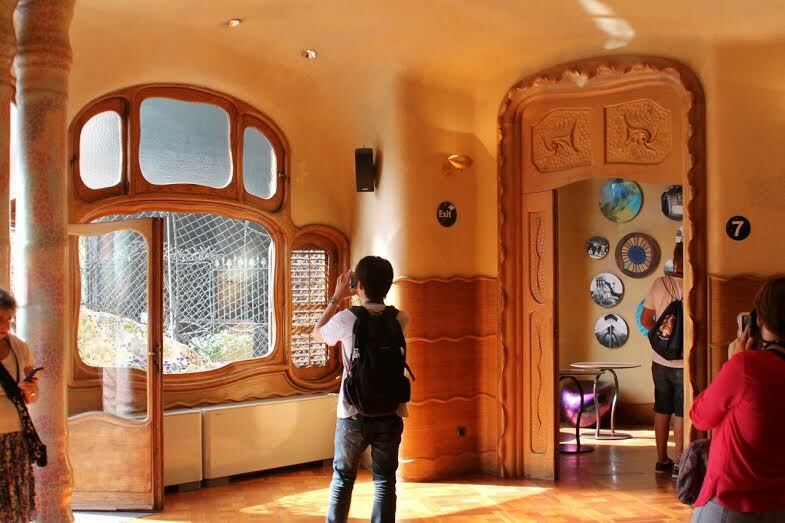 This entry was posted in custom door hardware, hospitality design ideas and tagged carved wood doorframes, casa battlo, gaudi tile work, tile mosaics. Bookmark the permalink.